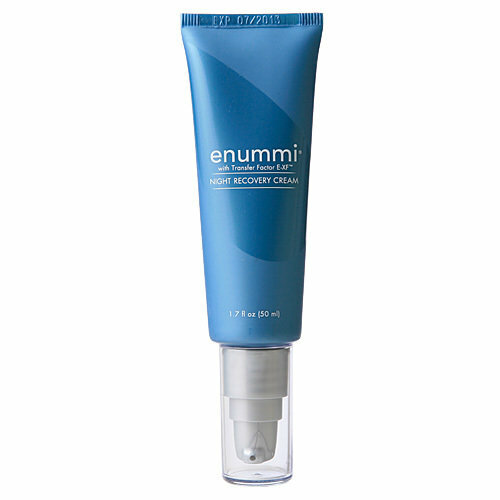 enummi™ Night Recovery Cream is formulated for all skin types to help your face recover from the stress of the day. Contains aloe vera, vitamin A and E, and deep moisturizing agents to balance and rejuvenate your skin. The natural antioxidants provide anti aging bene ts while moisturizing ingredients give dry skin a youthful appearance. Use Night Recover Cream every night and wake up to beautiful, refreshed skin. Aqua, caprylic/capric triglyceride, glycerine, aloe bardensis gel, diethylhexyl carbonate, polysorbate 20, ethylhexyl palmitate, phenoxyethanol, colostrum, polyisobutene, carbomer, acrylamide/ammonium acrylate copolymer, caprylyl glycol, luteum ovi powder, xanthan gum, tocopheryl acetate, sorbic acid, hordeum distichon extract, vigna aconitifolia extract, sodium citrate, parfum, panthenol, disodium EDTA, allantoin, xylitylglucose, xylitol, santalum album extract, phellodendron amurense extract, sodium hydroxide/ caustic soda, anhydroxylitol, chlorphenesin, methylparaben, and sodium hyaluronate. After cleansing and toning, smooth on face and neck. Use nightly for best results. To determine sensitivity, test a small amount on the inner forearm before rst use. As part of any skin care regiment, 4Life recommends the daily use of SPF 15 sunscreen to protect skin against UVA and UVB rays.